Plot Lake Victoria's annual Spring party by 50,000 young revelers is about to turn into a feeding frenzy with prehistoric hunger-pains. With knee-trembler's above the waves and tremors below, released from their dormant sleep, thousands upon thousands of flesh-eating nippers are released into the lake with whetted appetites and razor-sharp teeth. With a motley crew of strangers thrown together to defend these shores, it is now up to them to prevent the largest eat-out in human, and piranha, history. Awards 2 wins & 12 nominations. I finally got around to seeing this despite it being on my radar since it was released. Aja's films are usually on point for me and with a cast that involves Ving Rhames, Elisabeth Shue, and Christopher Lloyd, it sounded like a sure-fire hit. This was lame. Too much dude bro humor for my taste. It has plenty of blood and guts, but it feels like it's stuck on repeat when it comes to showing. Maybe it's a problem due to the limitations of the creatures themselves. Also, I didn't see this in the theater with a packed audience which likely explains why I just wasn't feeling it. It seems like the kind you have to be in a particular environment for to get the full effect. 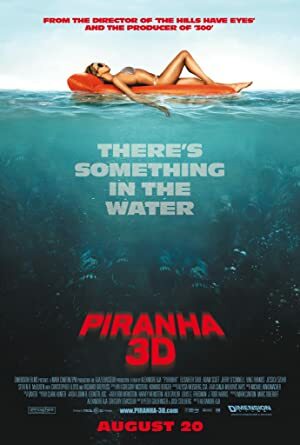 As it is, I'll take the original Piranha over it anytime. I've only seen the sequel, which is guilty of everything you didn't like about this one, but at least it was legitimately shot in 3D instead of post converted. It's not particularly good 3D of course, but it's real. I'm embarrassed to admit I even bought it. I try to support any 3D release I'm even slightly interested in to keep the format from going extinct. It's a losing battle at this point but I still try. I sorta want to try out the sequel just because of the director and the fact that it looks like it indulges further than than 2010 film, but I'm hoping it's more gore and less of the frat bro material. Even if it's the same amount, maybe a different approach to it may help. I may check it out for the heck of it one day. I had no idea you had a 3D television. I wish I picked one up when they were more affordable for the older horror movies being released these days. I do, yeah. I really love it but the future doesn't look so bright. In home 3D is basically dead at this point (actually has been for years), so when I have to replace this set I won't really have any other options aside from maybe getting a projector. Otherwise I'll be left with a stack of discs that can't be watched in their intended format anymore. It's a shame the way it all worked out. I found it used and bought it. I thought "The Hills Have Eyes" remake was better than the original, and thus I expected more from this movie. I agree that the humor killed the movie. Hard to sit through it, very unwatchable. All times are GMT. This page was generated at 04:35 AM.